Harmonic Master Scanner is a dynamic tool that helps harmonic traders to identify and draw harmonic patterns on the chart. Harmonic Master Scanner is a software designed to work in MetaTrader 4. 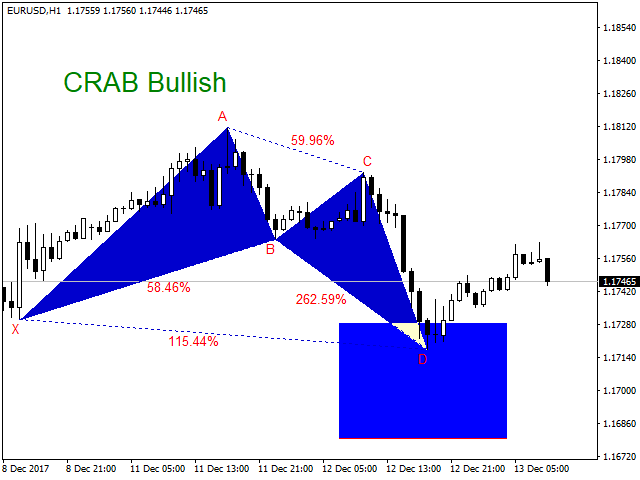 Harmonic Master Scanner works based on original MetaTrader 4 Zigzag indicator and the standard harmonic patterns elements. 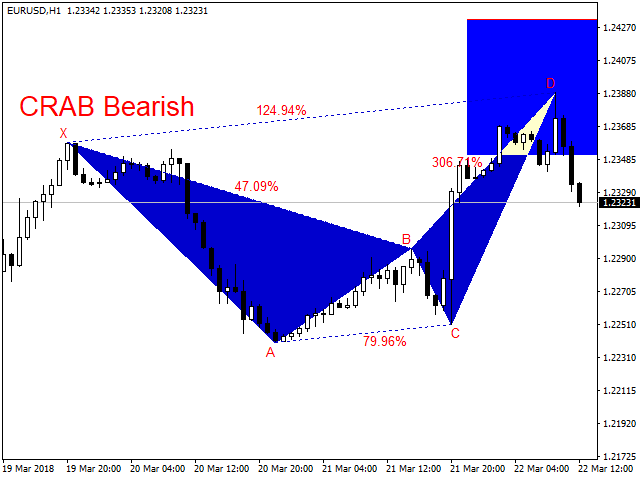 This software can send alert and email to you when a Harmonic pattern is detected on any charts. The entry point is the "D" point. The scanner only shows the present pattern one by one no historical patterns (you can use the backtest to build your own strategy). Because the full dependence on Zigzag indicator the scanner may redraw the "D" point (only the "D" point) or give fake alerts in case of pattern failure, so I strongly recommended you to use additional strategy to open trades like price action or divergence or as your own. The scanner represents the PRZ zone by a rectangle and the significant Fibonacci retracements from XA by red Lines. I have added the Fibonacci Time Zones tool to validate the time correction of the patterns, recommended correction is between 0.382% and 1.618% and the equivalent one at 100% is the best. The scanner includes 17 harmonic patterns (AB=CD – Gartley – Bat – Butterfly – Crab – Shark – Alternate Bat – Deep Crab – Cypher – Nen Star – Anti Gartley – Anti Bat – Anti Butterfly – Anti Crab – Anti Shark – Anti Cypher – Anti Nen Star). "ZigzagDepth", "ZigzagDeviation", "ZigzagBackstep" - Zigzag indicator inputs. "PercentAfter", "PercentBefor" - to give the scanner some flexibility you can add a percentage range before and after the individual elements like "B" point in the Gartley pattern. The percent is from the original Fibonacci retracements (means 0.5% from 0.618 before and 5% from 0.618 after as example). "C" and "B" points in AB=CD pattern. 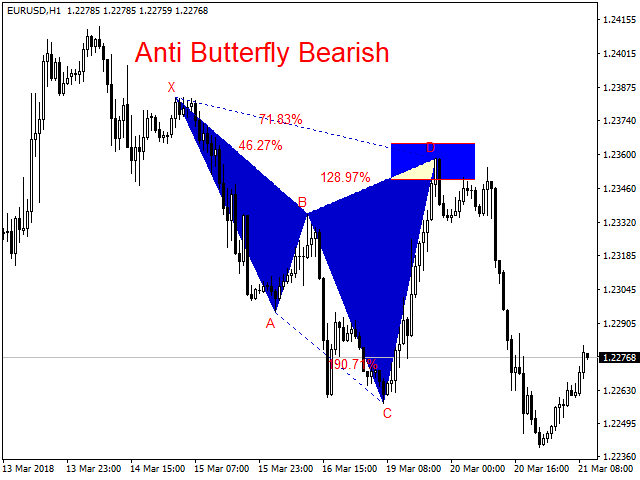 "B" point in Gartley, Butterfly, Alternate Bat and Deep Crab patterns. 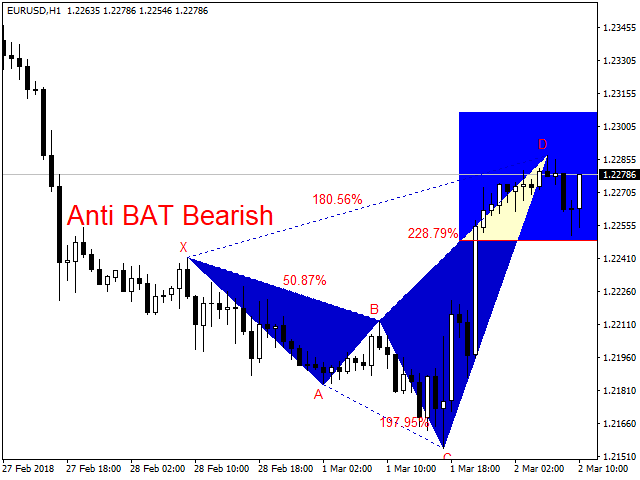 "D" point in Anti Gartley pattern. "UseABCD", "UseGartley", etc - Pause or stop scan for one or more patterns. "BearishWave", "BearishLabels", "BearishPRZ", "BullishWave", "BullishLabels", "BullishPRZ" - management for color visualizations. "SendAlert", "SendEmail" - Notification management. "ShowFiboTimes", "FiboTimesColor" - Fibonacci Time Zones tool management.